If Nothing Valley were a real place, it’d be mossy, verdant, and a little bit strange. 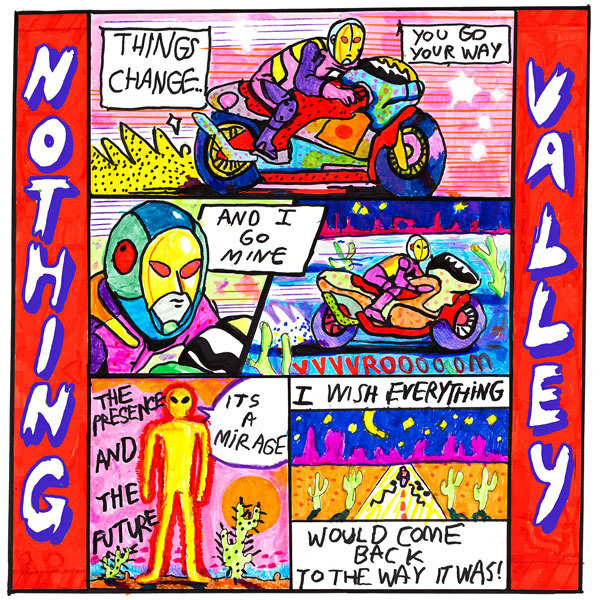 Melkbelly, formed by vets of Chicago’s experimental and DIY scene champions, organized noise and thoughtful freneticism on its debut full-length, Nothing Valley, fusing dreamy vocal lines and cantankerous guitar racket. Its songs clang and bang in stripped-down production that highlights the band’s sharp edges; multi-faceted slabs of sound serve harmonious, immediate songs. So it shouldn’t be a surprise that the band members’ tastes run obscure--The Hecks, Lightning Bolt, and jazz drummer Paal Nilssen-Love and, as they tell us, “bands and musicians that draw on a sense of adventure." The quartet’s membership overlaps with several Chicago noise and experimental bands and art collectives. An efficient one-day recording session resulted in Melkbelly’s first EP, 2014's Pennsylvania, which opened the door to touring and opening slots for Speedy Ortiz, Magik Markers and Built to Spill, and led to The Chicago Reader calling Melkbelly “one of the most exciting new sounds out of Chicago.” Next, Melkbelly got back to writing and working, recording a pair of 7-inches with Dave Vettraino at Chicago’s Public House where it had made its first recordings ever for Public House’s Digital Singles Series and a Public House compilation tape. The sessions gave the band a chance to deepen its collaboration with Vettraino. Miranda writes most of Melkbelly’s tunes on guitar and brings them to the band who puts them through the ringer, where they morph into a Melkbelly arrangement. Often, however, the band will take a guitar riff or two from an open jam recorded at practice and spin it into a song. Nothing Valley was recorded in early 2016 in Vettraino’s basement studio to 8-track analog tape. Fresh off a West Coast tour, the band let the hours on the road and missed art tourism opportunities at Spiral Jetty shape the songs as well as the recording process itself, writing half the album material in the studio. Nothing Valley breezes gust fresh and forcefully.